It's been a while since Libretta came out. Now is probably as good a time as any to explain every important aspect of it. Once upon a time, Kay was born. Some years later, Lauren was born. Many years later, Kay realized something about herself, and agonized over revealing it to anyone. On her birthday, October 23rd, she felt maybe it was time to tell her sister. 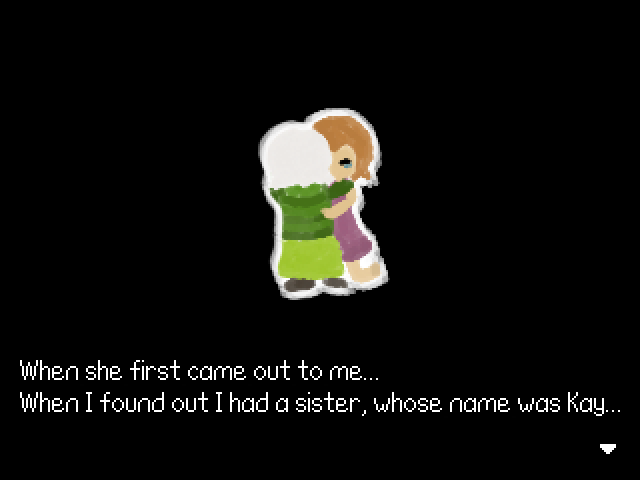 Days passed, weeks passed, but on November 14th, Kay came out to Lauren as a transgender girl. Lauren was surprised, but wanting only the best for her sister, she kept giving Kay love and support. While their parents were out, Kay was free to express herself as a girl. Meanwhile, Lauren started dating a girl named Suzy, which she also felt she needed to keep hidden from their parents. This came to an end one day when their parents found out what Kay was up to, and didn't get it the way Lauren had. The situation eventually drove Kay to run away from home. Looking for a place to stay, Kay met someone. (There really isn't any more detail to it than that, intentionally.) She wanted to trust them, but things didn't work out. And in the end, they murdered her. Lauren knew nothing of this, having been left a letter from Kay that said to wait for her at the library. So she kept going to the library, believing that Kay would someday return there. You, the player, download the game, start it up, and Enter Lauren's body. That said, Lauren is still more or less herself at the start. She has memories and a personality of her own: she remarks on books she's read or hasn't read, gives her opinions, etcetera. 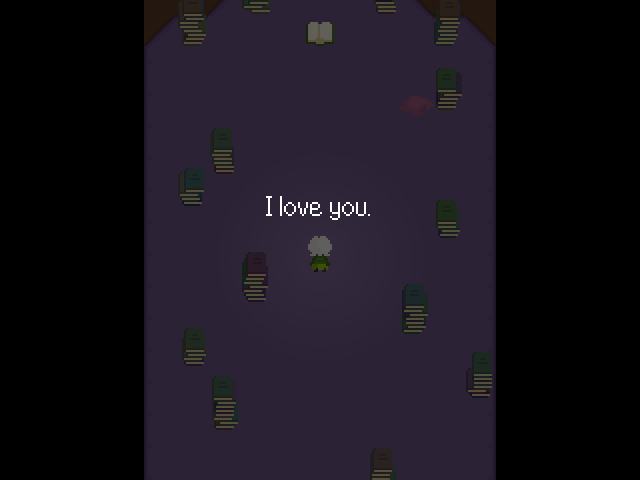 Yet the narration uses the word "you," because you are also her, even though you're not really... yet. Basically, for the time being, you are controlling a character who is herself, which means you must put yourself in her shoes. But that changes somewhat after the intro. 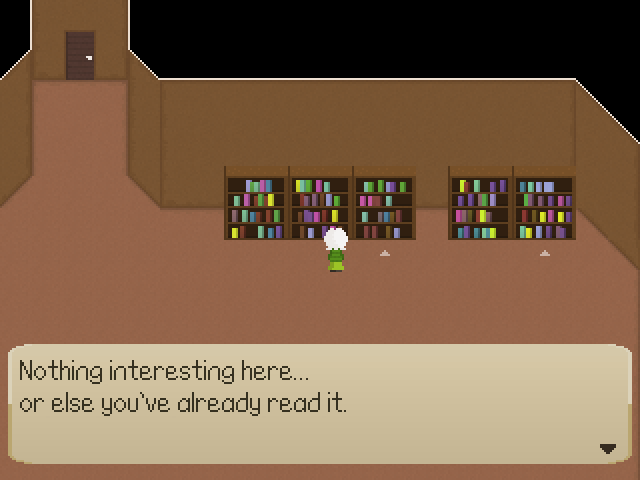 Most everything in the library hints toward aspects of the story in some way, but I probably don't need to explain each and every one. 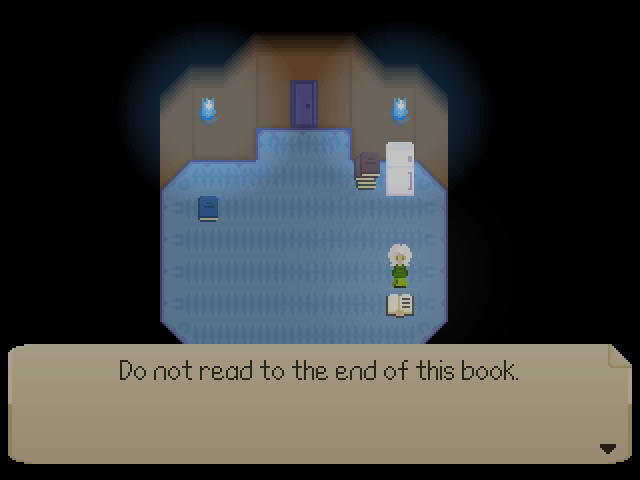 There are also a few references: Destiny of Flame to The Flame Egg in Mad Father, A Funny Story from The Witch's House (though this story is unfunny in a different way), Ib and Mary lookalikes arguing about the plot of Ib, I'm An Alien (the depressing 2ch story), etcetera. One book that's probably worth focusing on, however, is "What Is Our World?" It's presented in a confusing way, but highlights an important aspect of the universe the game takes place in: it's ambiguous and malleable, and shaped by people. The book theorizes that even the past could theoretically change as it becomes more vague to people, even going as far as altering facts about the sleeping Goddess who created the world. (The sleeping student with the history book ties into this.) If even that's a possibility, then their world truly is "what they make of it," which Lauren also concludes in the happy ending. You go upstairs and you find a book called Libretta. 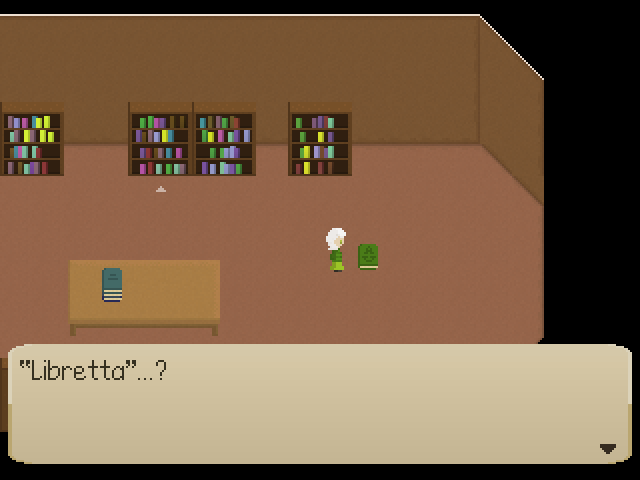 Libretta is Kay's life story, but it's both a book and a game - opening it begins the game proper, which causes the creation of the true Libretta... which I'll just call the Other-Library so as to not be aggravatingly confusing. At that point, Lauren's memories basically go blank until you make the choice in the ending, at which point your control of her ends. Now that the game has truly begun, you are "officially" controlling her, and you don't have her memories. So she becomes a mix of Lauren and the player, and this combination is what's referred to as "Libra." Who names her Libra? (Note: Being a name for two people, one of whom could be anybody, "Libra" doesn't have an exact gender per se. But I'll usually say "her" just for convenience.) Well, she's first referred to that with that name by the black books in the intro. Given the talk of choices and the use of YOU to refer explicitly to the player (rather than "you" (plural) to refer to the combined Libra), one can surmise the author of those is the Arbiter of Choice, AKA Fate. Fate noticed this oddity of the player Entering Lauren's body and found it interesting. So she set a few things up (manipulating the timeline to make the newspaper print incorrectly, as it otherwise could have told Lauren of Kay's death)... and fell asleep. Fate leaves the decisions here up to YOU, this outsider with strange powers like her own, in hopes she might find a solution to her dilemma of having to meddle in human affairs to keep them from destroying themselves. The "main books" are key parts of the overall life story that is Libretta, albeit made abstract. However, not only these books, but everything you read and do gets recorded in Libretta. Again, Libretta is both the book and the game. When you check the open, seemingly-blank Libretta books, it asks you "Save?" 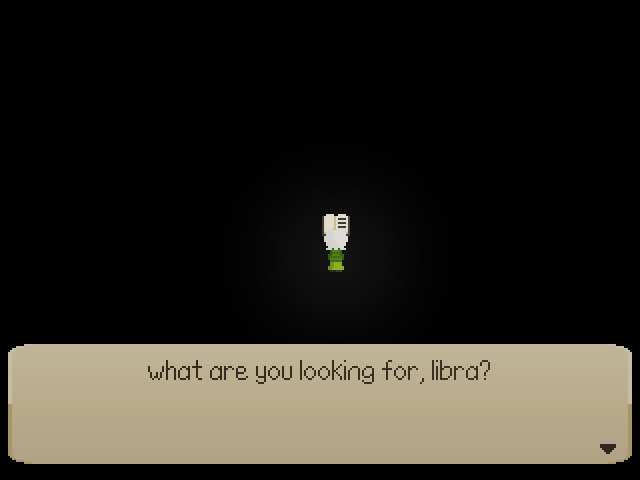 Note that it appears in a unique box in the middle of the screen - that's because it's being asked not to Libra, but directly to the player. Lauren has no idea why she keeps checking these blank books, as is alluded to after doing so enough times. 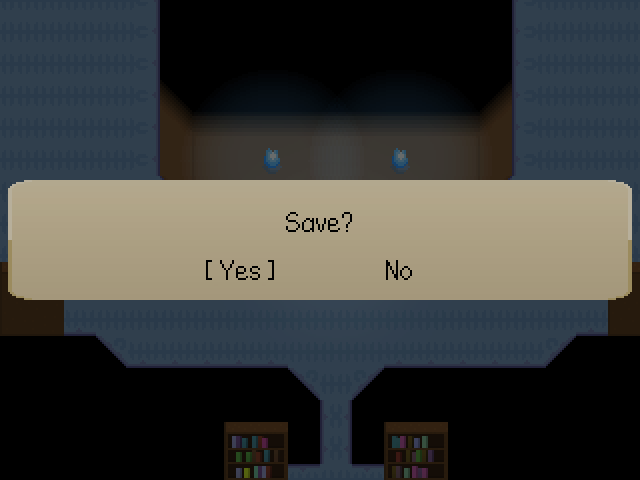 Of course, asking the player "Save?" is significant. The goal of Libretta, by my design, is to save Kay. If the player agrees to that, even if they're not aware it's what they're saying yes to, then their progress is allowed to be saved. All the books in the Other-Library are "written by" Kay, in a sense. It's a place based in her experience and memories, so while it's hard to give specifics, they're basically all written from her life and feelings. 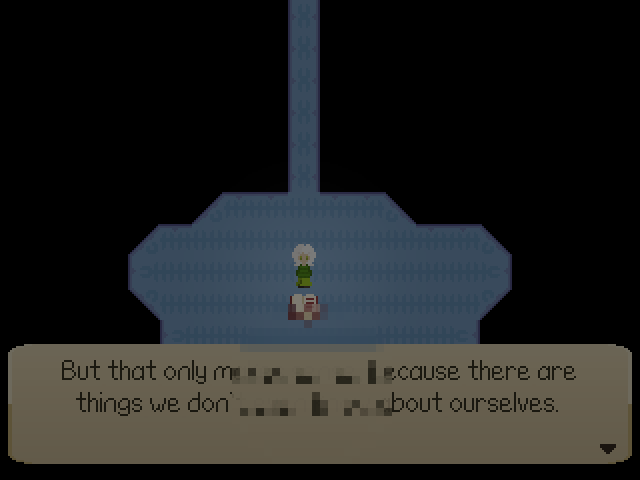 Reading things can cause them to manifest because, throughout the game, the player and Lauren are unwittingly working as a team. 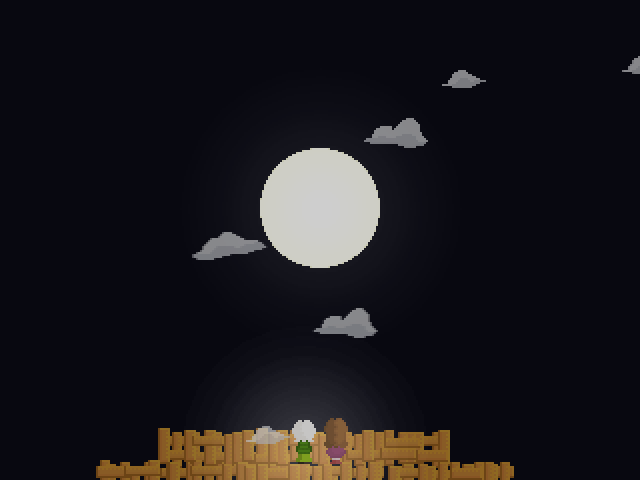 The player is an Alpha and Lauren is an Omega; in this universe ("The World Made From A Wish"), the wishes of an Alpha can be made real if an Omega strongly believes them to actually be true. And since they both come together in "Libra," Libra's beliefs can have immediate effects. 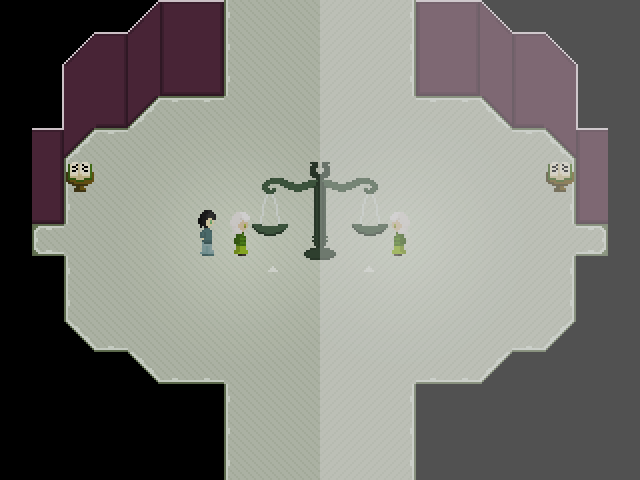 Libra simultaneously can and cannot speak - Lauren can speak, but the player is unable to fully communicate with characters in the game. Thus, the "compromise" is that Libra does not appear to speak, but the reactions of others imply that she does at times, leaving it up to the player to imagine what is being said. After reading a book about fearing the unknown, you meet a fuzzy monster. Kay fears "fuzzy monsters"; she can never perfectly understand or anticipate people. Yet also, she herself is a "fuzzy monster": she's unsure of herself, feels like an aberration... and also feels a fuzzy sense of comfort encouraging her to just let things stay the way they are. Both kinds of "fuzzy" serve as themes for the area, and there are both dangerous and harmless fuzzy monsters - which, continuing with the theme, you can't easily tell apart. Later, you meet Kelly. She's brought into being by reading the Fuzzy story, but since Fuzzy is metaphorically part of Kay's life story, she can easily be considered to actually be Kay. Being only one facet of her, though, she acts pretty different. Mostly she embodies Kay's sense of humor and pressure to be a good older sister to Lauren. 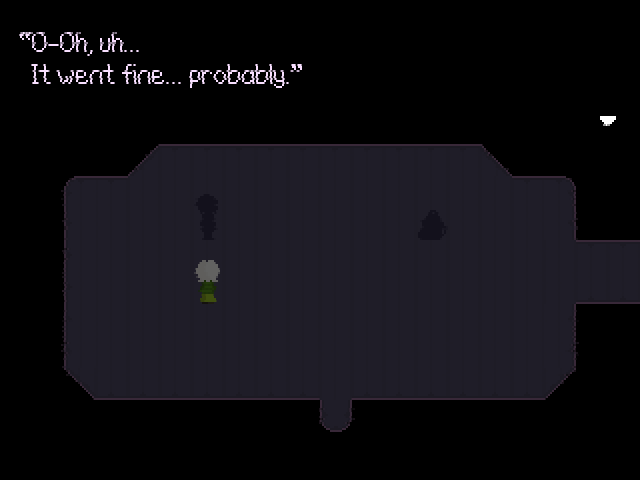 Throughout the area, Kelly behaves in a way that implies she perceives Libra as scared and is acting tough for her, but is more afraid and uncertain than she wants to admit. This mirrors Kay wanting to be a good older sister, but the reality being that she's not as strong as she wants to be and really depends on Lauren's encouragement. The Dogs and Cats book is written as a conversation in quotes because it's not something Kay herself thinks, but it's framed as something she overheard - people with willfully obtuse, binary views of gender. This is also why going along with it, sorting the pets into whatever categories you choose, gives you the pencil, since that aids in bending things to your will. 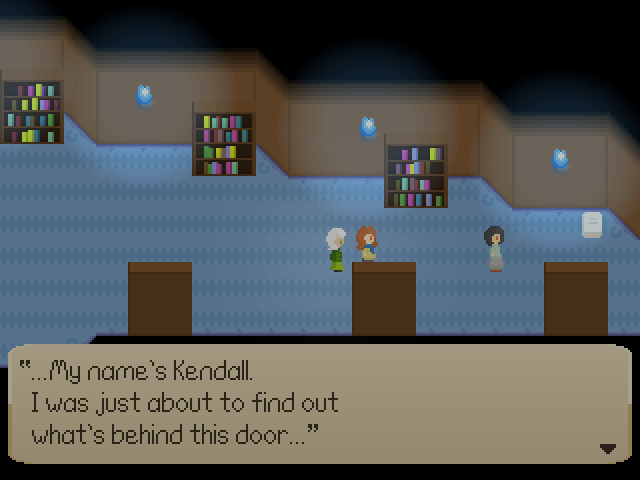 Kelly "falls behind" when entering the Chapter 3 room because she feels an unknown fear - that being Kay's fear of her killer. 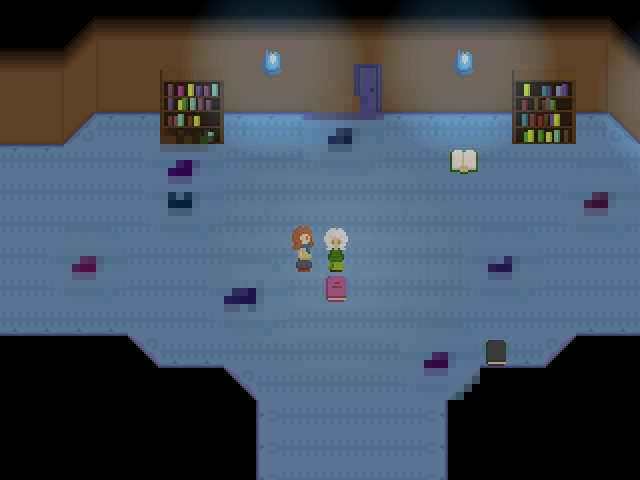 That's what the "monster at the end of the book" is: the monster at the end of Kay's life, who manifests in the Other-Library as Inevit, based on Kay's memories of that person. 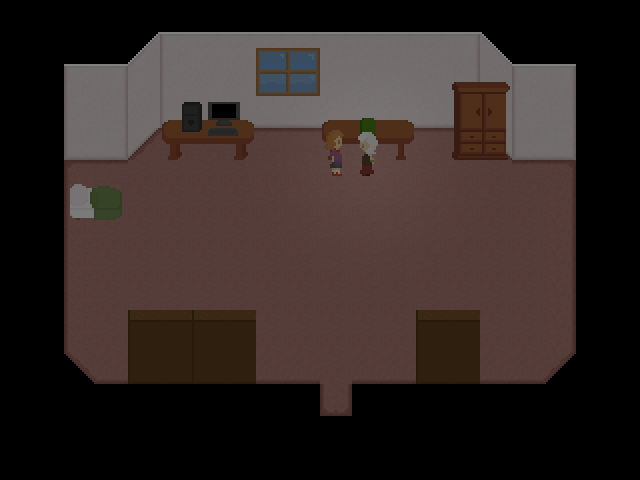 Inevit shouldn't be showing up this early, but Kay feared the idea of someone like them as early as when she was first questioning her identity, and so they have somewhat of a presence in that small room. They'll also kill you for "failing to follow the rules," which also alludes to why they hated Kay. 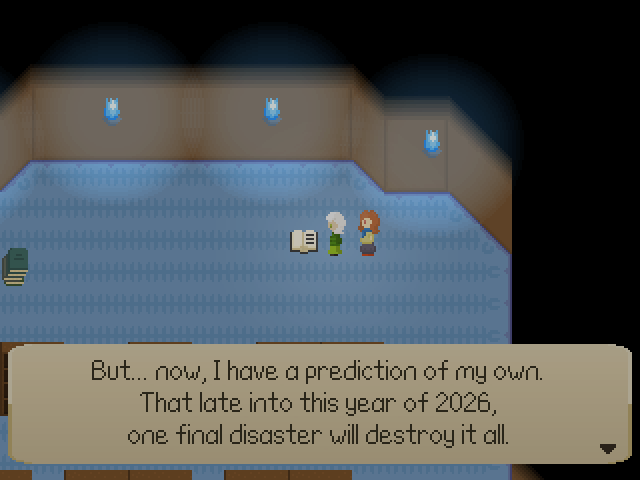 The disaster room has Kay predicting the worst for when she comes out. 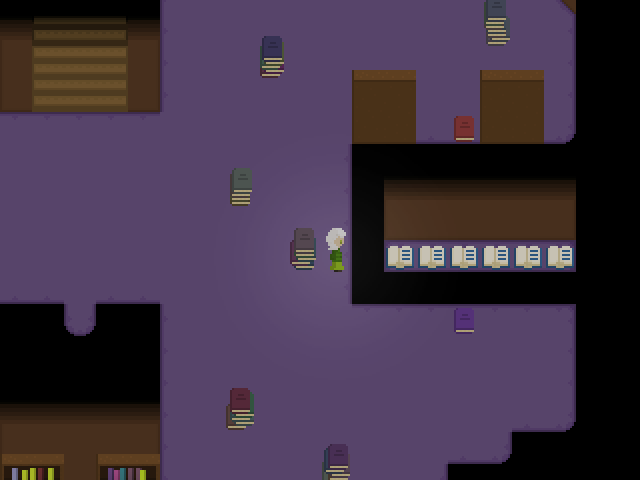 When you go past the given year, all the books go blank and the rest of the Other-Library vanishes, implying her metaphorical or literal death. But Libra being given a message of hope brings it all back, showing the impact of her belief (well, in addition to "changing the year" with it). In Chapter 4, it's shown that wearing glasses is painful for the girl in the story. This represents how Kay's eyes were opened to her own identity, yet also to the bigotry of people she'd trusted. (Also alluded to by the LRRH book.) This shock initially makes her wish she'd never known, and consider the idea of never actually coming out to anyone. 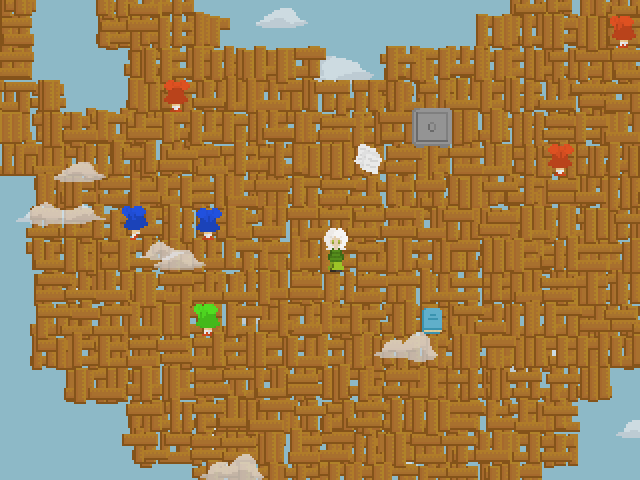 As you navigate the fuzzy maze, Kelly lacks the courage to follow and blends in among the fuzzy monsters. The directions don't take you all the way because, well, you can't expect someone else's directions to be perfectly accurate to your own path. The Seasons book concerns Kay's endless worrying of finding the right time to break the subject to anyone. Hence the calendar, which shows exactly how she kept "picking days" and letting them pass by until she finally told Lauren on November 14th. 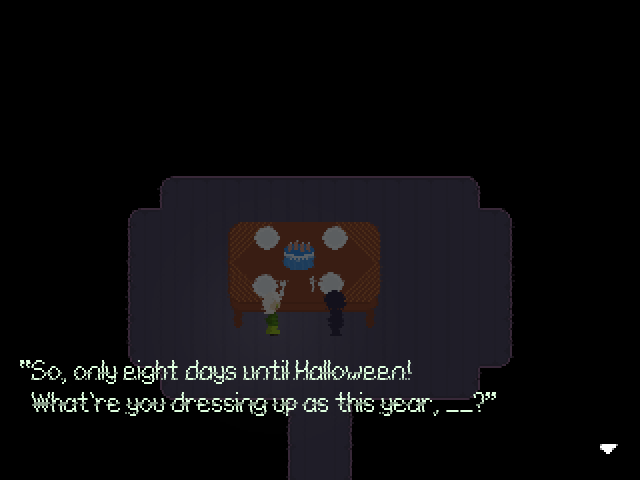 (Which is also the day the game "came out.") Kelly's comment on the calendar is a... call-forward?... to Kay in the birthday flashback: Kelly relates the circled date to her birthday, and Kay relates her birthday to the eventual circled date, using very similar phrasing. Using the cycling seasons, Kelly is able to take a shovel and uproot a dead tree to allow Lilycoils to grow. She feels it was meant to be, and feels good about doing it - because it represents discarding the unwanted parts of her pre-transition life. Fuzzy Chapter 6 also introduces a new character, someone who understands and comforts the girl. She then appears as Kendall. While Kelly may be considered Kay, Kendall is a fabrication made to keep Kelly company... by Lauren's belief in Kay, so she might be considered part of Lauren in a similar way. She stays behind to fulfill the role of comforting Kelly, which Lauren would want to take, yet can't because she has to move on to the next part of the story. So it's also symbolic that Kendall has the key to move on. The end-of-area flashback shows Kay crying to Lauren sometime after coming out to her, struggling with the idea that no one else would understand or accept her. The idea of the Mirror story is pretty straightforward: the people on each side of the mirror don't know left from right, because they look in the mirror and see who they think they "should" be. Thus, they want to get to the other side where they belong. The Clumsy book that appears where the big mirror was after breaking alludes to some circumstance of seeing what the "other side" is like, and realizing that's the way things really should be. I don't know what I'd say the doppelgangers "represent," but I guess the idea of looking in the mirror and seeing something that doesn't match up. You see them as Lauren with her head on backwards. (You might interpret that as an allusion to how Lauren has little idea of what's going on as you control her.) But to Mik, they look exactly like Mik appears to you (hence referring to them as "those guys"), which is not what Mik sees in the mirror. This is why Mik doesn't like the MIME screens, which also "reflect" them with that appearance. The clothes on the ground are clothes Kay borrowed from Lauren. If you look at them without Mik being there to interrupt, Lauren is able to recall that they seem familiar. Mik "falls behind" and ends up finding the maze, which they get a bad feeling about, presumably because when they go in there, they see what is to them an obvious doppelganger in the mirror. So they try to keep you away until you've exhausted everywhere else. The scales are in reference to the astrological sign of Libra being associated with scales and judgement. And here Libra can find that two things which should have equal weight somehow don't, alluding to inequalities among people. When Mik realizes they'll have to break the big mirror, they worry about the consequences, and the fact that "you can't fix a broken mirror." In one sense, that's true because you can't exactly "un-out" yourself to someone. In another, that's true because you can't bring back the dead. And in yet another, if a mirror reflects you "the wrong way," then the mirror is "broken," as in, not working properly. 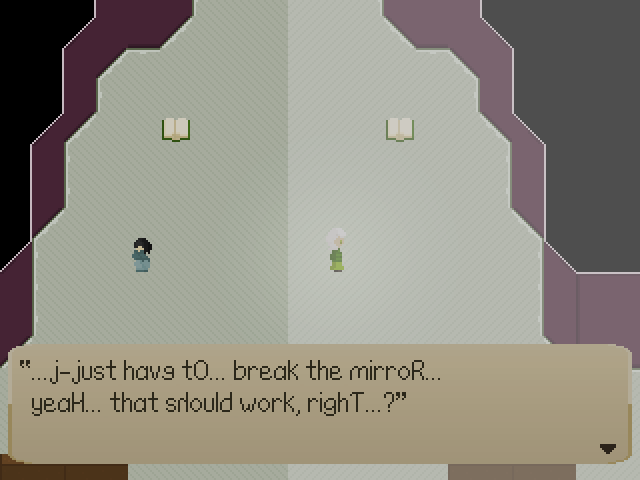 (See the character in SWSD breaking mirrors because they don't do what she wants them to.) However, Lauren seeks to fix all of these things which should be impossible to undo - the broken mirrors in Kay's life. The books on perfection and imperfection speak for themselves: people want others to be perfect, but they never can be, so this is another expectation Kay (or anyone, really) has to deal with. Both rooms are technically not perfectly symmetrical within themselves if you count the black space on the left and right, but they're passed off as being symmetrical, going as far as painting a door on the wall to match the real door on the other side. 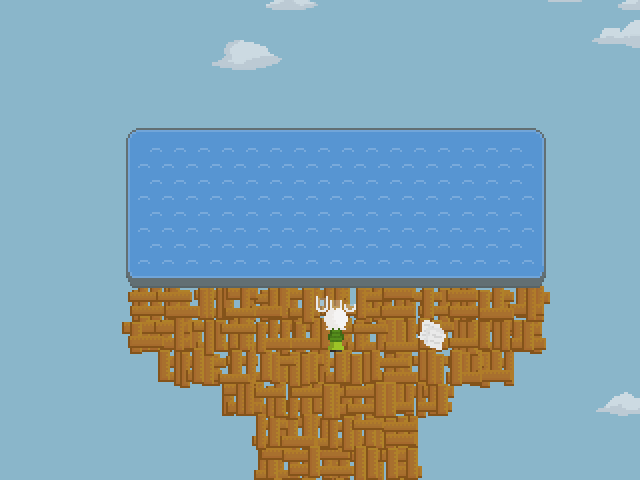 The symmetric rooms puzzle opens two chests: a flat chest and a curved chest. ...So, uh, that's why the curved chest is the correct one. At first, I didn't have much of an idea of how the ghost twins segment would work or what it would signify, so it is kind of weird. But probably the most significant part, that sums up what the point of it ended up being, is asking "Who always lies?" or "Who always tells the truth?" and getting the same answer to both: "Nobody." No such people exist outside of logic puzzles; real people will generally want to tell the truth, but encounter situations where they have to lie and hide things - in this case, primarily, being trans. And anyone in that situation doesn't want people questioning them endlessly when they have enough questions of their own; some answers instead would be nice. 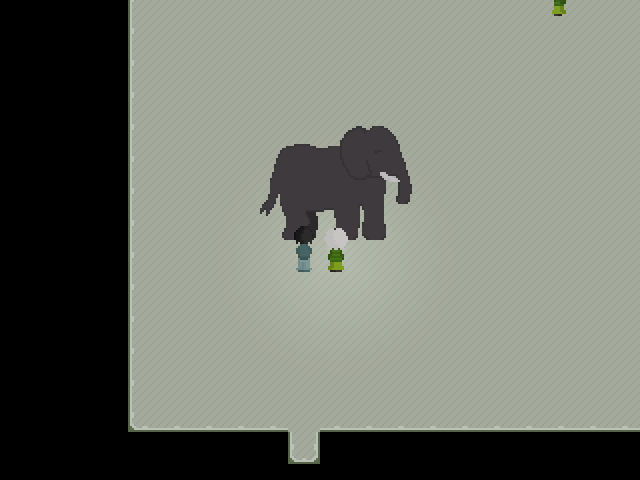 Okay, fine, I'll drop the "never mention the elephant in the room" joke for this post. It takes the place of the dining table on the other side because of situations like the birthday flashback, where there was from Kay's perspective a proverbial elephant in the room that she had to keep quiet about. The talk with Mik is probably fairly self-explanatory. Kay didn't want to seem weak, especially having a younger sister looking up to her, but she didn't think putting on a facade (see the Show book) made her strong. For her, letting herself cry is "stronger" than forcing herself not to; being herself is better than being who others think she is/should be. 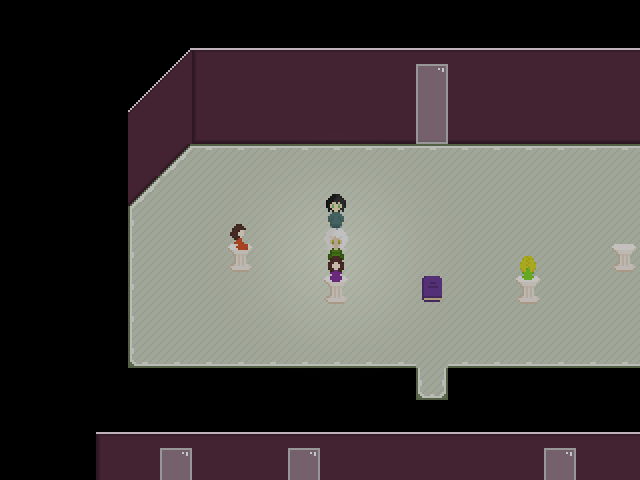 In the Chapter 6 room, it's implied someone went ahead and did the three puzzles to unlock the doors already. This would be Kim, who you might assume appeared after Mik's comment that they "hope there are more people like [Libra]." (Mik also mentions "other friends" when you meet, but that could have just been a bluff.) You collect pieces of a purple doll and put them together, then arrange it with three other dolls. This is an allusion both to the way Kay was killed (and subsequently, Libra trying to undo her death), and to Kay fitting in with other girls. The end-of-area flashback shows Kay crying to Lauren after her parents find out about her borrowing clothes from Lauren. Journey is the most perilous area, because Kay felt she was unsafe after leaving home. 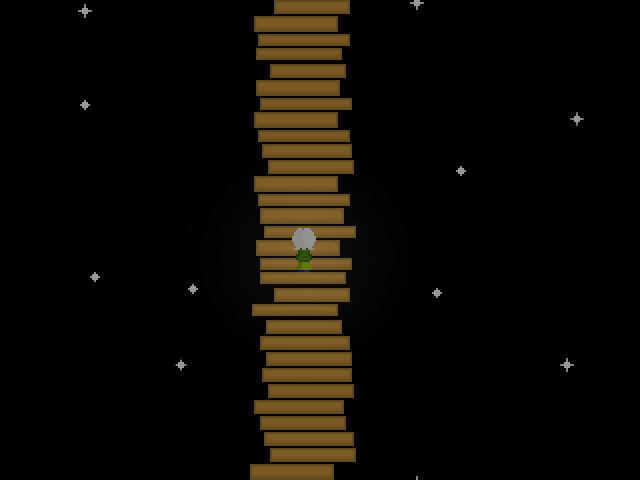 It's also way up in the sky, so it begins with a long stairway. Libra is always headed up: symbolically, it's because Lauren has to remain optimistic, and because she's getting closer to her dead sister... which makes the long stairs at the start of Journey a stairway to heaven. Journey's puzzles show a new level of Libra's "powers of ambiguity." Libra doesn't hold onto objects physically: they vanish into the inventory. There, they're nothing but text (which Lauren can't even see - during the dream, which is within Lauren's mind, the text for them is jumbled up). This is a format which allows for Libra to create anything that can be inferred from the item name and description, similar to how she can create things by reading books. Each meeting you have with Kamille follows a pattern and progression. When you first catch up to Kamille, she's standing at the edge, about to step off until you approach and she hastily steps to the side; she pauses to consider jumping off again on the way out. The next meeting, she's standing still in the path of a buzzsaw until Lauren pushes her out of the way just in time. The last time before she joins, she's not willfully putting herself in danger, it's just an unexpected accident. You gradually convince her that you care, and it helps her get away from suicidal thoughts. Chang'e is a similar entity to Kendall and Kim, created to comfort Kay. But much like how Kamille has become somewhat self-aware of her nature, so has she. She gives the name Chang'e because she represents the moon, which Kamille mentions looking up to every night for guidance. (If she lives, she'll reappear in the area where Kamille later goes to see the moon.) But the moon in turn represents the "unreachable" thing Kamille is searching for (acceptance). So Chang'e dismisses herself as not real and incapable of helping Kamille; that said, she came into being out of Lauren, who is real and can help Kay. The walkers are dresses without torsos who represent other "travelers" like Kay. The "construction of a building" book alludes to how each area matches a body section: Fuzzy is the head, Mirror is the body, and Journey is the legs. 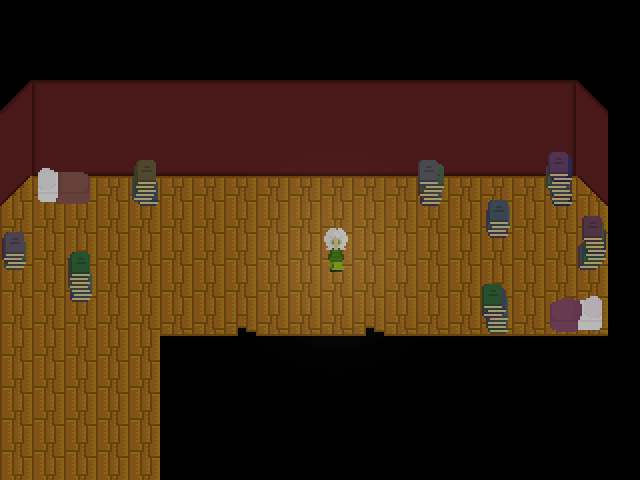 (And while these are ordered from top to bottom, you traverse the library from bottom to top.) So Journey incorporates this in a rather literal way via the walkers. This also ties into a greater trio of themes that match the three areas and other elements of the game: "thought," "appearance," and "action." Fuzzy is about Kay's thoughts on her identity and coming out, Mirror about her appearance, and Journey about the actions she took. The first hub area of Journey has a restroom and a bathroom. Naturally, public restrooms can pose problems for trans people, so it fits for it to be dark and creepy. 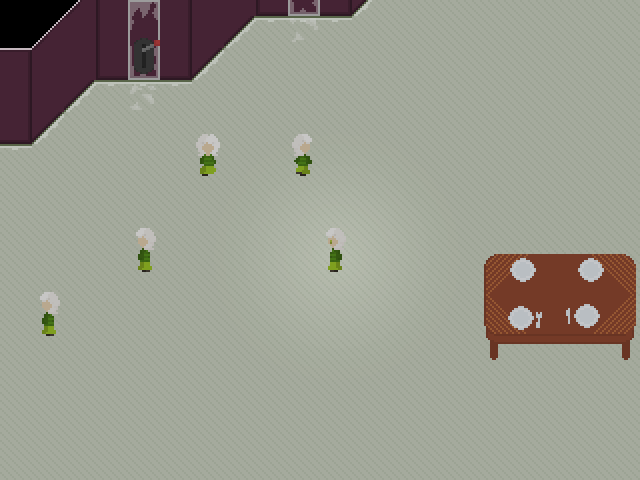 (More of a restlessroom, really.) 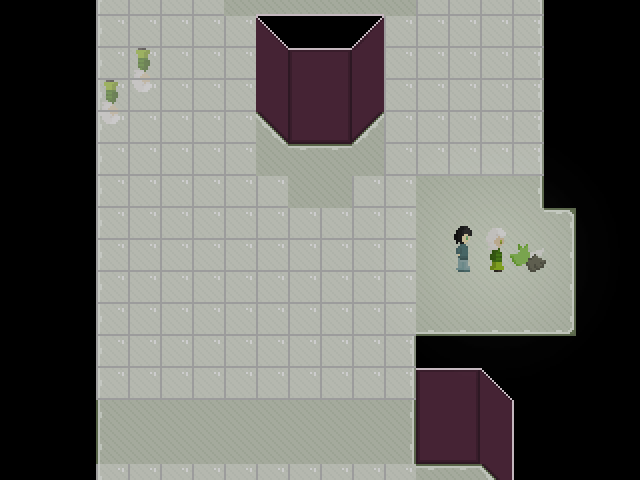 The bathroom also continues the "suicide" theme by having both a bathtub and a hair dryer. While there's no way to combine them directly, the "plug" from one is used with the other. When you pick up the glasses, Libra wonders how they got there, concluding that "maybe they didn't break, maybe [I] just lost them." This metaphorically is talking about Kay, who Lauren wants to believe is alive, just lost for the time being. (Lost, but not "lost.") Also, Kamille saying that they're "more than a pair of glasses" is... actually a pun about how they contain three (more than "a pair," two) glass cups for use in the puzzle. Also, just to be silly, there's a "filling room" open only in the day and a "filing room" open only at night. Libra is afraid to walk the tightrope on her own, but she trusts that Kamille will be okay. Kamille's proficiency at walking the tightrope alludes to the metaphorical tightrope Kay walks just by being trans, and the situation gets her thinking about fears. 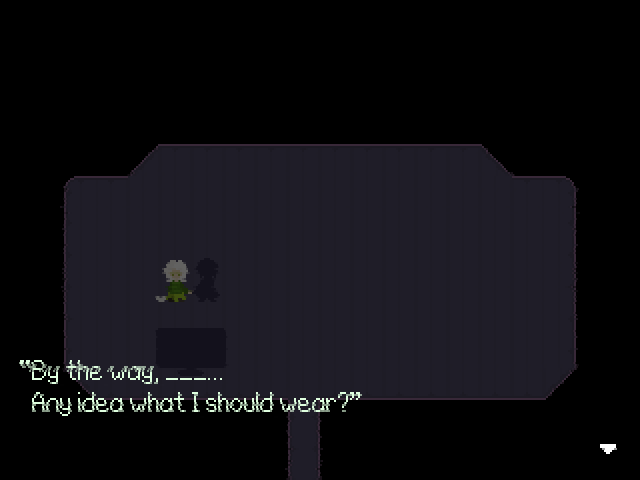 The fears Kamille has in mind are more abstract things like isolation and not finding acceptance, yet the player is intentionally offered only ordinary common fears as options, which is not what she really wants to hear. Choosing not to answer is the best you can do, and she empathizes with this, as she also has difficulty talking about her fears. 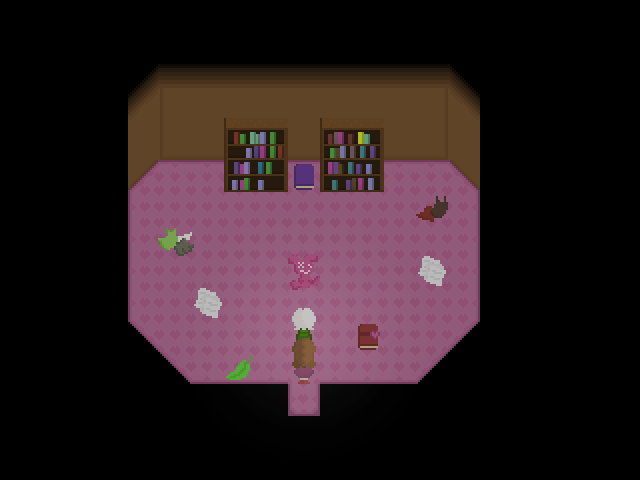 The pink room is locked both with a riddle and a key because it represents Kay's deepest-kept secrets. There are clothes she secretly borrowed from Lauren, a cute stuffed animal and carpet, a test with doodles of girls (drawn out of admiration and also what she aspires to be), a diary which she's too indecisive to have written anything in, a play script (tying into the "libretto" meaning of the title) implying careful planning for how she wanted to come out, and a rhyme alluding to her escapist desires (to be specific, wanting to be a "bird," which can be interpreted as "girl"). Starting around the bird rhyme, Kamille begins to remember Lauren and her identity as Kay, and reaching to save Libra as she jumps off the edge helps this along. Lauren has a dream, which allows her to go in her subconscious and see some of her memories. In the first flashback, Lauren demonstrates her abilities on Kay's math test: Kay hasn't looked at the score, so it's in a state of uncertainty. Lauren believes she did well on it, which actually impacts the grade. As of this flashback, Kay hasn't yet come out to Lauren, so Lauren uses a different name with two letters. 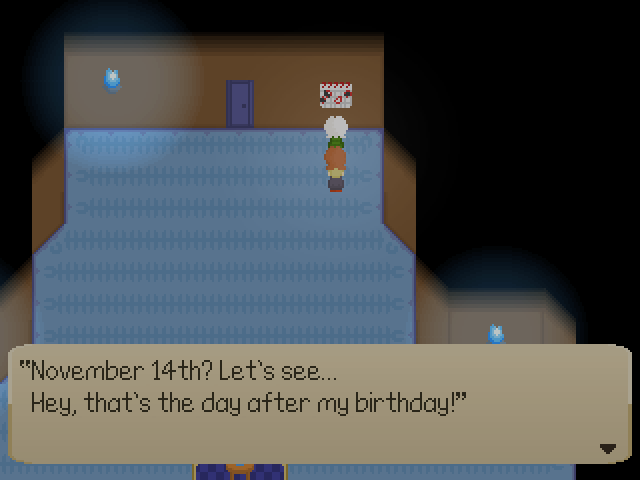 In the second flashback, it's Kay's birthday. Her name is staticed out in the song because it's her birth name, which bothers her to hear. Lauren perceives her dissatisfaction, and talks about how she has a present she's sure Kay will love. This gets Kay excited momentarily as she imagines what she'd really like to get for her birthday - most notably, things which affirm her femininity, like feminine clothing. But she soon realizes that's not possible because Lauren doesn't know she's trans yet, and even if she did, she wouldn't present such a gift to her in front of their parents. So regardless of what Lauren's gift was, Kay can't help but be a little disappointed, but still understands that Lauren cares about her. Thus, this serves as a motivator to come out to Lauren soon, though it takes her a while to finally do it. In the third flashback, Kay has come out to Lauren, and they're playing games (with Kay trying on a dress) while their parents are out. It's apparent that they're more open with each other now and enjoying themselves; Lauren has also told Kay about her relationship with a girl named Suzy. She's hesitant about going on a date with her, however, out of fear her parents might find out. Kay reassures her that it'll be fine, and suggests Lauren might as well come out to their parents as bi (or gay) soon. Lauren replies that she "thinks the same thing about [Kay]" - she has faith that Kay coming out as trans will go fine. But for the time being, they evidently don't feel ready; when they hear their mom coming home, Kay has to quickly run out and change clothes. Between flashbacks, Kamille recalls memories of her sister Lauren and gets the feeling that she's not really "Kamille." She feels Libra is familiar yet unfamiliar, because while she is Lauren, she's being controlled by the player and has a different name. And Lauren feels the same way, as Kamille is like Kay, but somehow different. At the end of the dream, Kamille sees bloodstains implying her death, seems to remember that "this is how it ends," and apologizes frantically to Lauren for everything. In the moon conversation, Kamille puts some things together about being Kelly and Mik and Kay, and Libra/Lauren being her sister. Though still not sure of a lot of things, Kamille asks if Lauren will believe in her no matter what, and Lauren nods - but unlike prior instances, there is no textbox saying that "you" ("Libra") do. 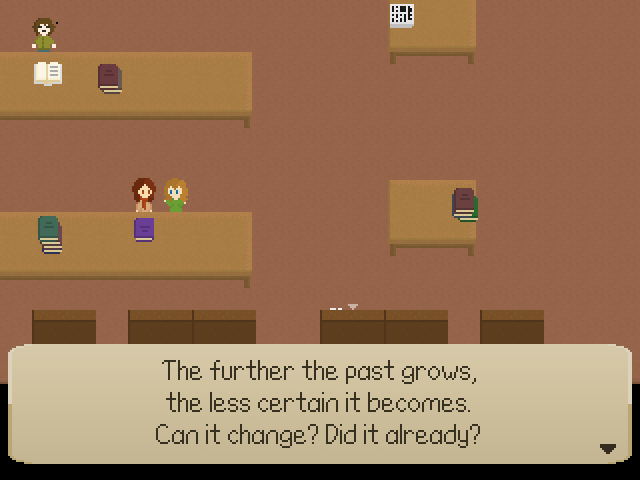 The filing room puzzle plays upon the save books, the text for which undergoes a progression in each area: "Save?" "Will you save?" "Will you save your file?" By looking in LSA, the extension for the game's save file, you find "your file." The LSA file is like an extension (appendix) of Libretta the game (or book) which tracks progression. So looking for it provides a tool to force progression without having to find the (non-existent) key for the door. Chapter 5 introduces "the boy," representative of the person who killed Kay. 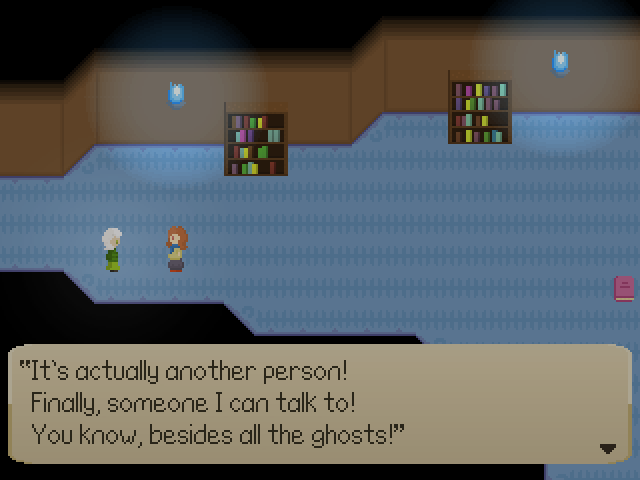 This makes Inevit (as mentioned, an entity that comes from Kay's memory of her killer) manifest. They call themselves "an inevitability" because that's just how Kay viewed them: someone who would come along sooner or later. They challenge Libra to a game of "Shirigory" where the category is "ways out," but this is heavily stacked in favor of the "death" interpretation. As Inevit says, Kay also sought a "way out" - however, like Kamille saying she "doesn't want to be lost to the void," she decided she didn't want it to be death. "Sticks and stones may break my bones, but words are so much worse" is basically a summation of what Inevit signifies. Kay's killer "broke Kay's bones" (specifically, they dismembered her, further emphasizing how they saw only her physical characteristics), but this is just a single incident - the reason the killer is left so ambiguous is because they're just one of many. The hurtful words that gave them their mindset led to this tragedy, so the game is about using that same power of words to instead make the world a better place. And if words cause someone's belief to be broken, it can have terrible effects. 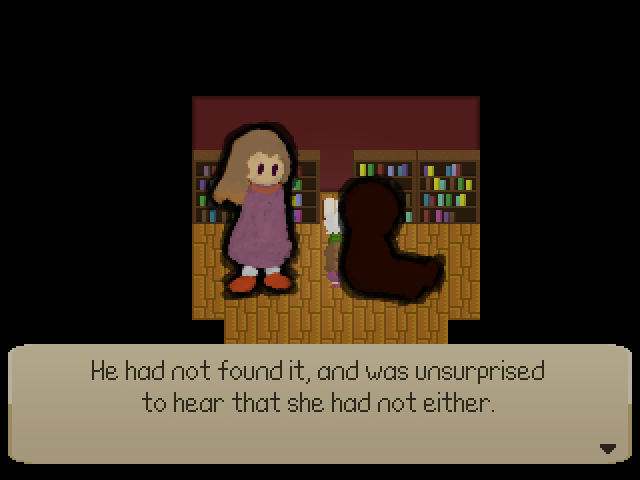 The end-of-area flashback shows the contents of the letter Kay left behind for Lauren before running away from home, which led to Lauren regularly visiting the library in hopes that there would be a happy ending to this. The intro to the area shows how Lauren - not Libra - is beginning to get exhausted, but pushes onward with what can be more or less read as responses to each of the end-of-area flashbacks, begging Kay not to leave. 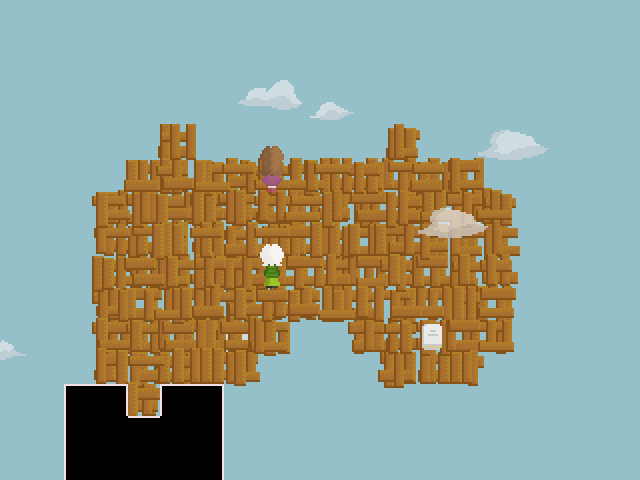 The item puzzles are somewhat abstractly related, but are specific in places. The missing nail file throwing everything off alludes to how simply knowing what "transgender" even meant helped Kay make sense of things. "Needing a bucket to hold it all" alludes to Kay's crying which she keeps hidden as part of being closeted. The scene with the flashlight alludes to Kay wanting to just comfortably stay where she was - whether that's being totally closeted, or only Lauren knowing, or etc. - but knowing she should move on. The S/word encounter alludes to when Kay's parents found out, which certainly was "...an experience" for her. Chapter 1 talks about how Kay lived her life according to societal expectations before realizing it wasn't the way she wanted to live. Chapter 2 is about her hiding her thoughts about being trans because she was too afraid to tell people. Chapter 3 is about telling Lauren and being relieved and encouraged by her. Chapter 4 is her parents finding out before she could tell them herself and reacting poorly. Chapter 5 is about running away and wishing that her sister could make things right. Most of the various other books in-between are pretty direct views into Kay's thoughts, more or less fitting between Libretta chapters in the order they're read. The two blank-covered green books, however, involve the roles of Alpha and Omega. "Alpha is creator, Alpha is orchestrator, Alpha is instigator" refers to the three entities in the story who are Alphas: myself, Kay, and the player. The identities of these three are also hinted to elsewhere, such as the three apples that fall from the sky for "author, storyteller, and listener." 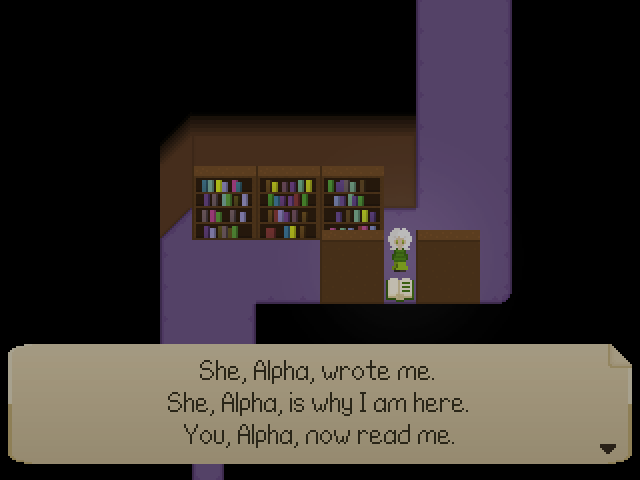 They all certainly fit the designation of "Alpha" in the sense of being associated with a beginning: I made the game, it's Kay's story, and the player is the one to start playing the game. 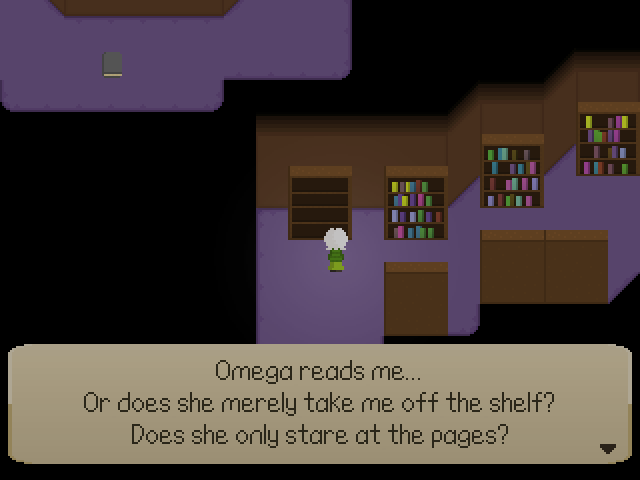 "Omega reads me... Or does she merely take me off the shelf? Does she only stare at the pages?" points out how Lauren (the Omega who makes this possible - note the shape of her hair) is just a vessel at the moment, and the player has all control, but Lauren's still wishing that things will end happily. Also, in the earlier areas, there are green books which allude to related topics: how belief can make a difference in the world, "the judge [Libra, the Scales] serving as executioner [not necessarily killing someone, but executing her own will]," and "the wish of the Alpha allowing the will of the Omega." 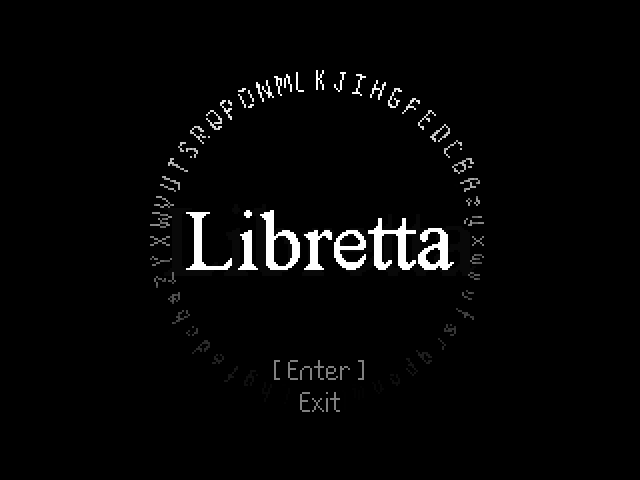 Lastly, the symbol on the cover of Libretta is an A (capital alpha) and an upside-down Libra symbol, which contains an omega. 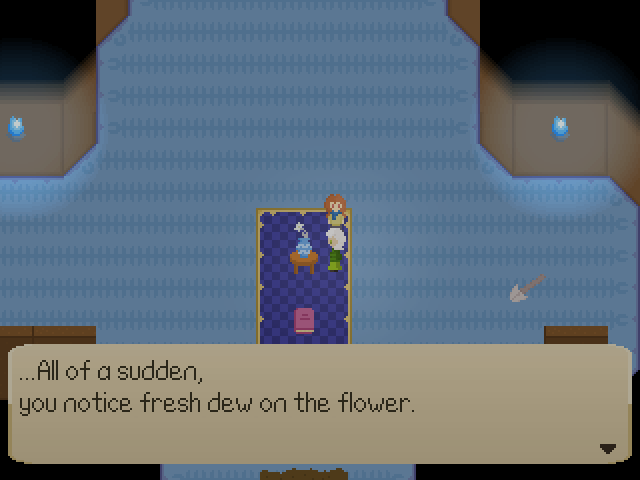 The room of happy endings to the fairy tales alludes to what Lauren is said to have done as a kid (and effectively does in the happy ending): rewriting stories she didn't like. My Sister Kay implies that Lauren is/was writing a story about Kay's life like she said, but had to rewrite so much (both in light of Kay coming out as female and the unhappy parts of her life) that nearly all that remains is a hope for a happy ending. 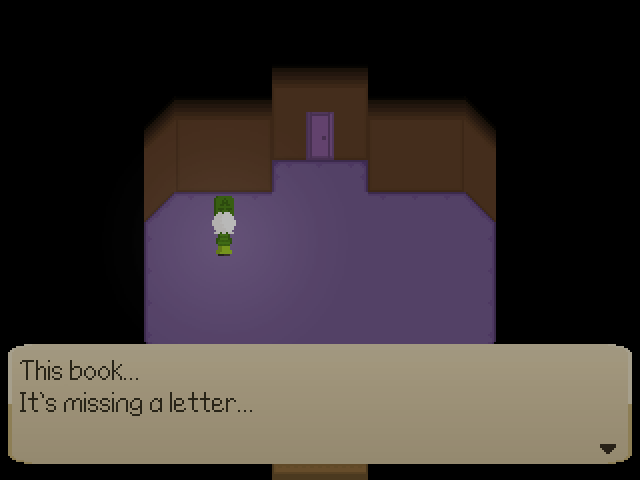 The final save book requires the Letter Kay left behind, which becomes the letter "A" by way of the inventory mechanics. It's a symbol of Lauren holding onto her belief in Kay, which is why Inevit mocks it at a certain point. And adding an "A" is essential in several ways - making it Libretta rather than Libretto, accepting the name "Kay," and changing a wish to "live" to a reality of being "alive." "Letter" also sounds similar to "let her," as in "let her be alive," or "let her be free." The description for Libretta in your inventory says that it's Kay's life story, so at that point, her life is literally in your hands. On the way up the (intentionally totally-wrong-looking) final stairs, Kay - as the three partners - asks for your acceptance. How you answer influences Kay's belief in herself, which is also an important component of letting her come out alive. As mentioned in the Libretta chapters, having Lauren being accepting of her gave her the courage to proceed. 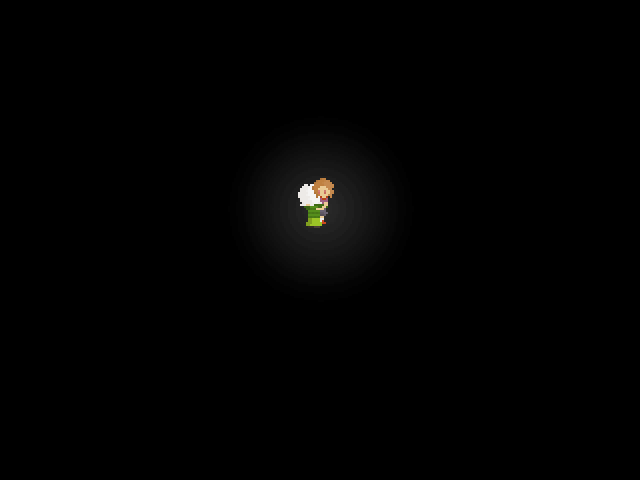 In the end, you meet Kay and are given a final choice, presented directly to the player rather than to Libra. 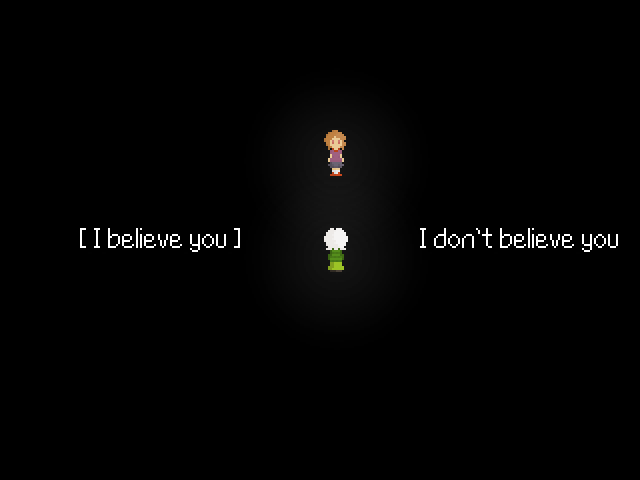 Various things can sway the feelings of the involved parties to make the successful realization of the happy ending more or less difficult (by causing "I believe you" to flicker). 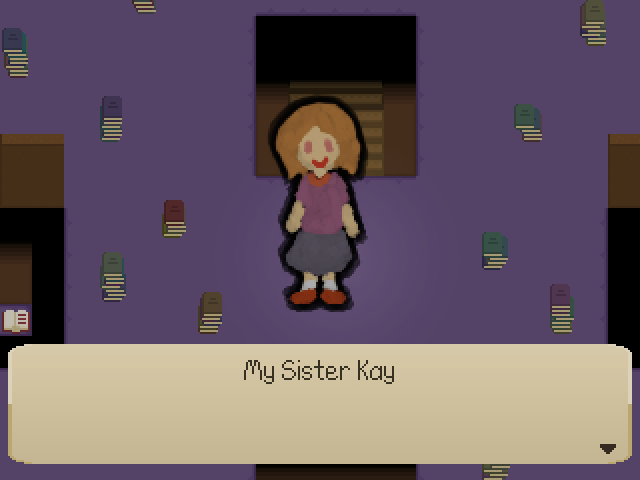 For instance, reading My Sister Kay both gives the player an early look at Kay's present appearance (so she's not a new character who appears out of nowhere asking for your trust) and reminds Lauren exactly what she wants (even as far as the specifics of "rewriting a story"), so it helps a lot. 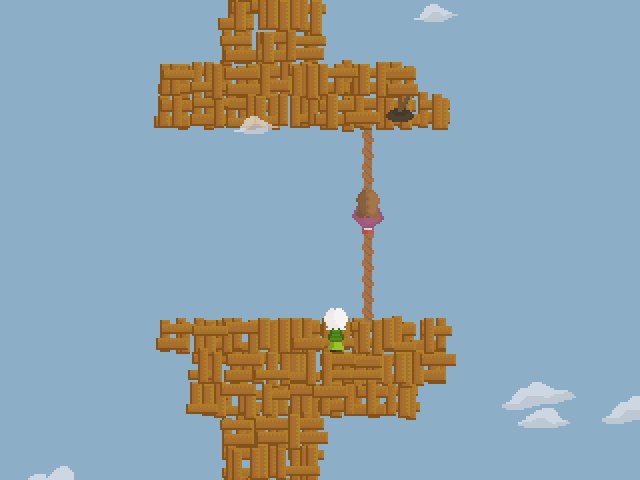 Believing makes it a success and not believing makes it all a failure; either way, the player loses any real control at that point (signified by a flash and the camera changing position slightly). 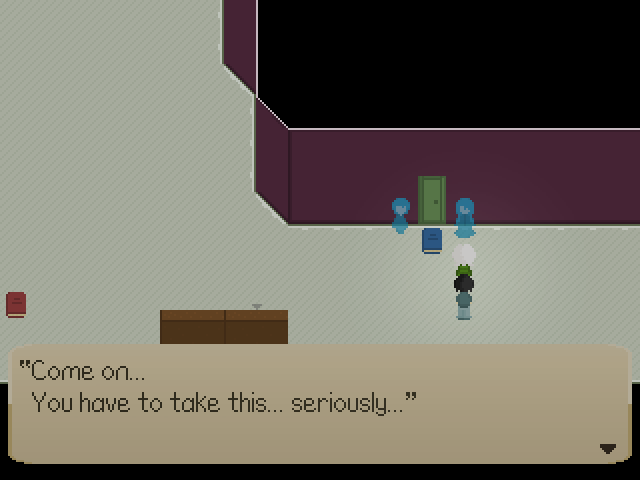 After the choice, Lauren's thoughts can be seen through the textboxes, and in the happy ending, she has a moment of utter confusion after the player leaves. "Where... Where are you...? No, I mean... Libra...? No! ...Where am I?!" She's gotten used to the textbox narration, and the use of "you" to refer to herself and the player, and being called the name Libra. 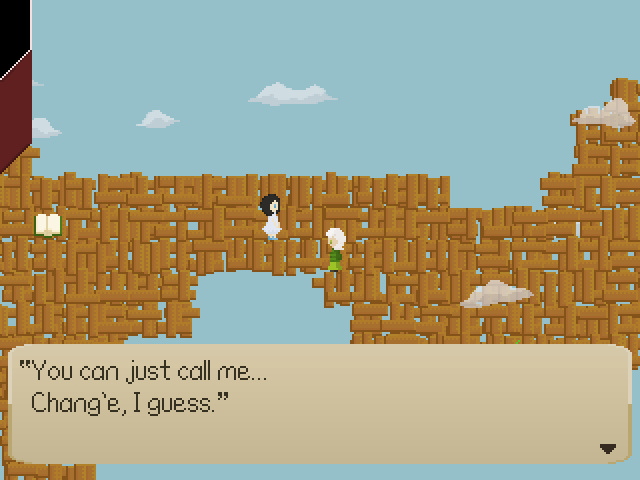 But with the player gone, she can finally regain her own identity. Kay thanks her, having an inkling that Lauren's "power to grant wishes" has come to her aid again. And since history has been changed such that Kay was able to return to the library safely, "no one had to be lost": Kay didn't have to die nor be afraid, and the purpose of the Libretta book was achieved, so Lauren no longer had to get lost in the Other-Library. So everything gets taken back to the moment Lauren first found Libretta, where she instead finds Kay. Part of the song Pollyanna is quoted at the end because, well, I love it and it suits the game perfectly considering how I didn't plan that at all. 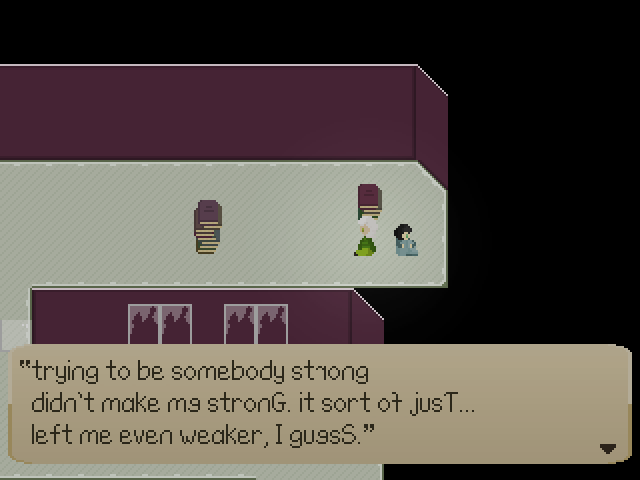 I guess making a game about remaining optimistic despite harsh truths just happened to result in some of it appearing. Indeed, the happy ending is a "miracle," Kay has seen her sister do a few before, she wants others to see the world like she does, and she can get a second chance because Lauren believes in her. I did change a few things to better allude to other parts of the lyrics after this realization/decision (dew on the Lilycoil, the sun might rise again, the bluebird flying away...), but nothing major. Back in the real library, Lauren has a feeling the librarian was somehow involved, which is technically true: she (an avatar of Fate) fell asleep to allow the people involved (mostly the player) to make their own decisions and actualize the happy ending. The sisters go home, and Kay is able to come out and be supported by her parents. Though Kay forgets so she can be Finally Free ("Libre"tta), Lauren still remembers everything that happened. In this new reality, there was no "unwanted outing," and evidently the reason Kay ran away from home here was just from the pressure of her uncertainty. Figuring they'd like to know how things turned out given their cooperation in making it happen, Lauren attempts to contact the player by writing in My Sister Kay, the "real-world" equivalent of Libretta. She explains what things were like from her perspective and gives the player encouragement, knowing the way this worked out was unreal and that most aren't so lucky. Also, she's totally all dressed up for a date with Suzy. And that's Libretta: the story of Kay's life, with inspiration from my own, just not for the really awful parts. 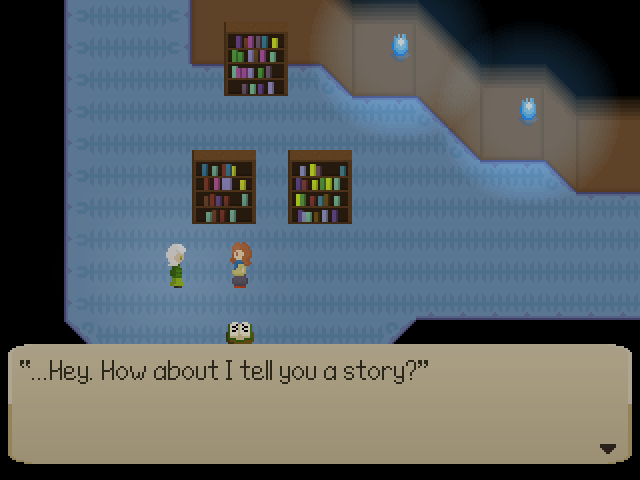 Starting from "a horror game about books," with not much deliberate planning of what kind of story to make it, it somehow ended up being this one. There were earlier iterations of the plot that had Libra and her trans sister, but that's basically all they had in common with the end result. 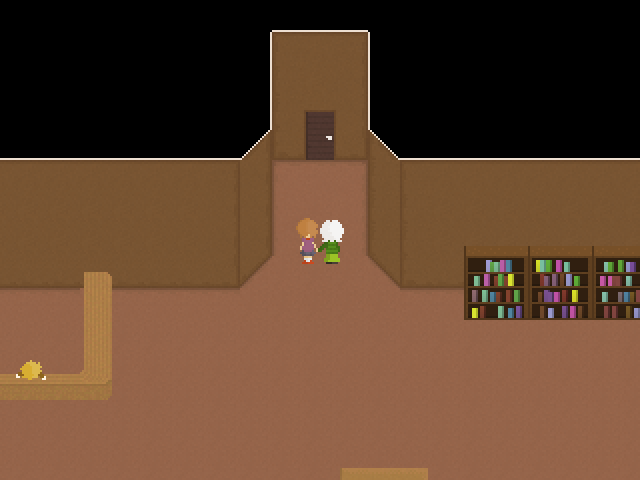 And before even that, a very early idea was that you'd explore with your big sister for most of the game, but at one point she'd tell you to wait, go into a door, and it would slowly dawn on you she wasn't coming back. It doesn't have quite the same impact, but I guess in a way that's still there, huh? If I had initially set out to make a game about the things this game is about, it would actually probably turn out very different. Deciding early on that it would end with Libra's belief saving her sister, and proceeding to make everything tie together, locked me into having to make a story where Kay was dead but got brought back, which I came to find was a very strange and difficult thing to execute well. Also, wondering "okay, if Libra has that kind of power, why would it not surface until now?" 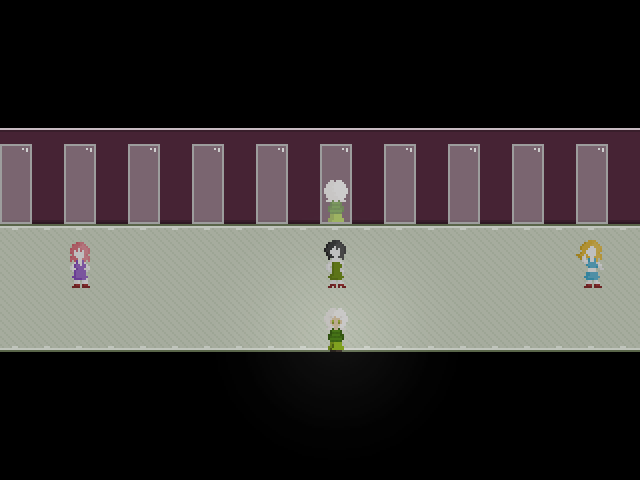 led to the idea of Alphas and Omegas and the player's "role" in the story. It proved a bit difficult to explain the Libra/Lauren thing since it mostly only fit in at the end, but suffice to say, you can expect better implementations of similar ideas in the future. As always, accept it with love.